My American Airlines flight was on time. How did I arrive on the wrong day?! Evan Hunt recently made an embarrassing self-ticketing mistake on American Airlines that forced him to miss a business meeting. His time zone confusion led him to take a flight to Hong Kong that landed as scheduled but one day too late for the important meeting. So why is he contacting a consumer advocacy organization about this blunder? Hunt says American Airlines did not inform him of the significant time zone changes (and date changes) involved in flying from Dallas to Hong Kong. As a result, he wants compensation of an undetermined value from the airline. Hunt’s case is a lesson in the complexities of planning international business travel and of personal responsibility. If you choose to make your own flight arrangements, it’s critical to confirm the time and date of your flight’s arrival. If you don’t, no airline is going to bail you out financially or professionally. Hunt’s saga began when he decided to book his own flights for his business trip to Hong Kong. As scheduled, on March 25, at 10:35 a.m. Hunt boarded the nonstop flight from Dallas to Hong Kong. All seemed to be going well as the aircraft landed on time 16 hours later. The local time: 4:10 p.m. But Hunt was in for a sudden shock when he cleared customs and turned on his cell phone. He immediately began receiving a multitude of urgent text messages and emails. Something was wrong — very wrong. “WHERE ARE YOU? YOU MISSED THE MEETING — EVERYTHING!” one of Hunt’s colleagues texted. Time zone confusion — What day is it here? Although Hunt thought that his American Airlines flight had landed on Sunday — he had crossed multiple time zones during those 16 hours. His plane took off on Sunday but landed late Monday afternoon. While he was making his way to Hong Kong, he had missed all of his scheduled business meetings. I asked Hunt how he had determined that American Airlines was to blame for his own time zone confusion. I took a look at the itinerary Hunt included in his paper trail. He was correct; it didn’t explicitly say that the flight would land on March 26. But it also didn’t say that it would land on March 25 either(as Hunt stated in his complaint). It had no arrival date indicated. But the trip showed a length of 16 hours and 35 minutes. Hong Kong is 13 hours ahead of Dallas. When the flight took off at 10:35 a.m. in Dallas, it was already 11:35 P.M. in Hong Kong — Sunday night. There isn’t any possible way to take off in the morning in Dallas and land in the afternoon of the same day in Hong Kong. Despite these facts, Hunt said he depended on American Airlines to display the correct arrival date. He based his request for compensation on the omission of the arrival date on the screenshot of his flights. When Hunt returned from his futile trip, he began a letter writing crusade placing the blame for his missed business meetings squarely on American Airlines. And although he did, for the most part, follow all the excellent self-advocacy guidance from our publisher Christopher Elliott, his complaint went nowhere. Repeatedly, the representatives at American Airlines explained why the company would not accept responsibility for his self-ticketing mistake. I understand how frustrating it can be to learn that you’ve booked the wrong date when making your reservation online. While aa.com does offer several opportunities to review and confirm your selected itinerary prior to purchase, mistakes sometimes happen. Based on the fact that the flight does list a flight time of 16 hours and 30 minutes, and shows that dinner and brunch will be included, it would be fair to say that it was implied that you would not be arriving a 4:10 pm the same day. I’m sorry, but we will not be extending compensation. This response did not satisfy Hunt. He continued to forward his complaint to other contacts at American Airlines. Even though all the facts pointed to one simple self-ticketing error, Hunt wasn’t ready to admit to it. And that’s when Hunt sent his request for help to the Elliott Advocacy team. Our credibility with consumers and with companies depends on our team carefully vetting every request for help. We don’t directly advocate all cases that hit our helpline. But we are wholly dedicated to resolving the cases that we do accept. We do that by researching policies, regulations and finding every detail that supports and proves the consumer’s position. When we contact a company on behalf of a consumer, we do so when the facts are on the consumer’s side. We try to present a case that no executive can turn down. With that in mind, Hunt’s case was not one that I could advocate. I explained to Hunt that the details as he laid them out pointed to his own time zone confusion. It would not be fair to expect American Airlines to compensate him for his own self-ticketing mistake. It’s worth a business traveler’s effort to find a knowledgeable travel agent to help book international trips. Professional travel agents are well versed in time zone changes, cultural norms, tips and other relevant facts that would have been invaluable to Hunt. If you ask your travel agent to book a flight to arrive on Sunday — you’ll likely arrive on Sunday and not Monday after your meetings are over. If you’re intent on booking your own travel then a time zone converter such as TimeAndDate can help. 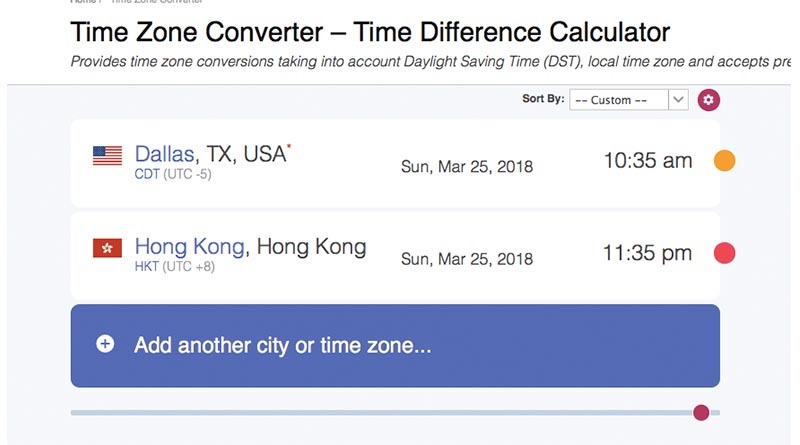 Had Hunt used such a converter he would have been able to see the dramatic time zone difference between Dallas and Hong Kong. And he would have realized that there is no way to leave in the morning and land in the afternoon of the same day for his itinerary. But what if you miss a business meeting and the airline is at fault? We often receive complaints from passengers who have missed meetings or special events after an airline delay. Unfortunately, in the United States, there are no laws or regulations that protect travelers in these situations. The airlines are free of any liability to reimburse for incidental expenses incurred as a result of a delayed or canceled flight. Q: Is an airline required to reimburse me for expenses if it cancels my flight and I am forced to miss my cruise, honeymoon, wedding, concert, or other activity? A: No. Airlines are not required to reimburse you for any trip costs affected by the canceled flight, such as a prepaid hotel room, a cruise, a vacation, concert or other tickets, or lost wages. The DOT recommends, as does our advocacy team, that you always schedule your flights well in advance of any important event. And, of course, if you are traveling internationally, don’t forget to factor those time zone changes into your plans! Should I have asked American Airlines to compensate Hunt for his self-ticketing mistake? Michelle is the executive director of Elliott Advocacy. She is a consumer advocate, writer, SEO-lady, and psychotherapist who spends as much time as possible exploring the world with her family. You can contact her at Michelle Couch-Friedman. Follow us on Linkedin, Twitter and Facebook. Read more of Michelle's articles here.